Learn how the thoughts of over 5,200 renters can make you a better marketer. Get the most comprehensive analysis ever conducted in the industry on the impact of technology and social media on apartment marketing and operations. Get your copy of the report today! Opinions from real renters, insights from industry experts and a whole lot more! From social media & search habits and the impact of online reviews to the renting lifestyle & most valued amenities. Insights from the top minds in the apartment business, including Tami Siewruk, Lisa Trosien, Dennis Smillie and more. Use the research to get more out of your marketing & customer service efforts. What do they expect out of their rental experience? How important are ratings and reviews? How do renters shop for apartments, and how does it impact your marketing efforts? We asked, and now it’s ready for YOU. 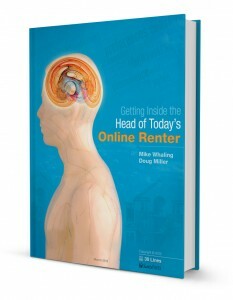 Getting Inside the Head of Today’s Online Renter is the most comprehensive analysis ever conducted in the industry on the impact of technology and social media on apartment marketing and operations. Feedback from thousands of residents from 20 diverse management companies — plus insider input from industry experts like Lisa Trosien, Tami Siewruk, Dennis Smillie, Sue Weston, Jen Piccotti and more — can help you make more informed decisions regarding how to best allocate resources to have the greatest impact on your portfolio’s bottom line performance. Real opinions from over 5,200 renters. Expert insights from multifamily industry experts like Lisa Trosien, Dennis Smillie and Steve Gilbert. The info you need to be a better marketer and rent more apartments.